also referred to as umbrella heaters, work by burning methane and/or propane gas for a few minutes of warmth, or more, depending on the amount of gas. The flames are directed towards a perforated metal screen which then causes heat to spread outwards the heater in a circular manner. One of the properties of heat that you folks probably aren’t familiar with is that it always rises upwards. This is because it is very light since it has no vapor droplets within it. So, a lot of heat will try to escape upwards instead of the directed path. This can result in a huge amount of heat loss. To counter this, the metal below is coated with silver color which is a terrible absorber of heat and a great reflector of heat, both properties beneficial for us. Latest technology patio heaters include the ones that use infra-red rays and incident them onto nearby surfaces, causing the surroundings to warm up. Although these patio heaters may sound pretty neat, our environment doesn’t like them so much. 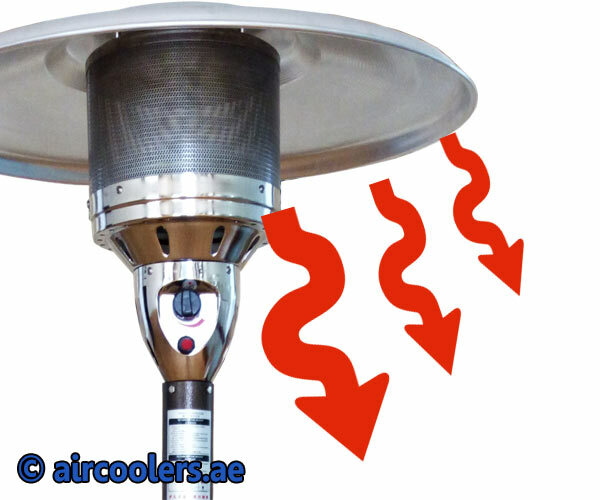 One patio heater can create a whooping four tons of carbon dioxide annually. Use wisely!